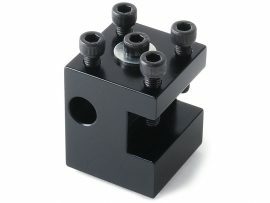 Sherline now manufactures its own inserted tip carbide tool holders. They are available with 55° inserts individually as a right-hand holder or a left-hand holder, or a pair. 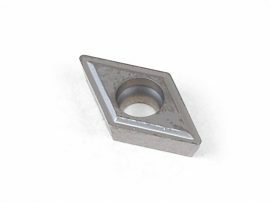 Each comes with a 55° carbide insert, hold-down screw and special Torx key. 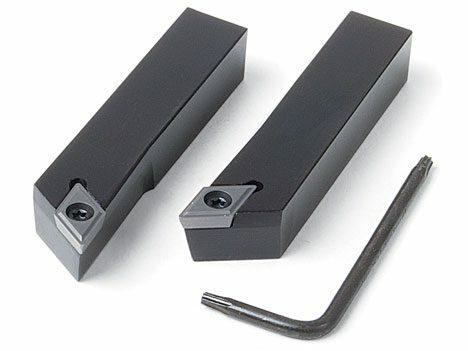 The 3/8″ square shank is held in a 3/8″ tool post. The 5° offset angle of the tip makes it easier to accomplish certain cuts. For example, by using the tool holder square with the crosslide, you can turn an O.D. up to a shoulder and then finish the shoulder by backing the tool out while still maintaining the proper tool clearance. 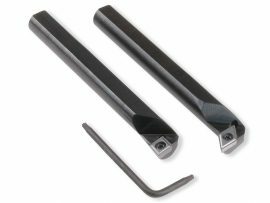 The tip of the cutting tool is .375″ from the bottom of the holder, which is the industry standard. 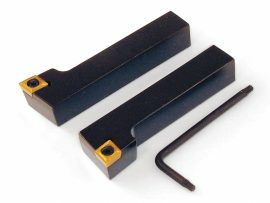 The holders are made from case hardened steel with a black oxide finish. Though relatively expensive, if a cutting edge becomes dull or chipped, the insert can be removed and rotated 180° to expose two new cutting surfaces, providing, in effect, two tools for the price of one. The primary method of cutting metal on miniature machine tools is usually with high-speed steel tools as they are inexpensive, easily resharpened and can be ground into “form” tools for special jobs. However, inserted tip carbide tools can be lifesavers for some jobs. Though more expensive and not able to be resharpened, carbide tools hold their cutting edge when cutting exotic metals or abrasive materials and can speed up the cutting process. This is why they are used for most cutting tasks in the modern professional machine shop.